Published by Cyril Huze November 16th, 2012 in Builders, Customs, Editorial and Events. 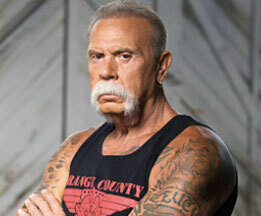 After 10 years and 233 episodes of a style called the “Doc Soap Reality” TV show, Discovery has decided to cancel American Chopper, one of its most popular programs. The custom bike that you will see in the December 10-11 “4-way build-off” TV show on Discovery, also called “The Revenge” (a face-off against Jesse James and the 2 builders of the series “Fast N’ Loud”) should be the last one built by the Teutuls that you will see on TV. Ikuo Yokoyama was just one man among hundreds of thousands of people directly affected by the devastating earthquake and tsunami that struck Japan in 2011, but his name will likely resonate with motorcycle enthusiasts for some time. Yokoyama’s 2004 Harley-Davidson FXSTB Softail Night Train was in a container box that was swept away during the tsunami in March 2011, and it washed up on the shore of British Columbia where it was discovered almost a year later. 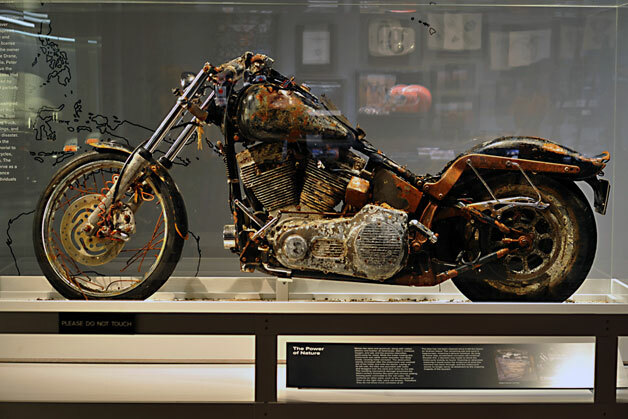 His motorcycle is now on display at the Harley-Davidson Museum in Milwaukee, Wisconsin in the exact same condition that it was found on the remote Canadian beach back in April. After the motorcycle was traced back to Yokoyama, Harley-Davidson offered to have the bike restored and returned to its rightful owner, but instead he has asked that the motorcycle be kept in its current tattered and corroded state and displayed as a memorial to the victims of the earthquake and tsunami. Yokoyama lives in the Miyagi Prefecture, which was one of the hardest-hit areas of Japan, and in addition to his motorcycle, it’s reported that he also lost his home and three family members as a result of the natural disaster. The Los Angeles Times has reported that “Pope Benedict XVI will bless [ Harley-Davidsons ] at the Vatican next June as part of the Milwaukee manufacturer’s 110th anniversary.” Want to know more? So would I! But there aren’t many details available just yet. One one hand, this makes perfect sense, because nothing encompasses the spirit of Harley-Davidson motorcycles like the approval of an authority figure. Especially when that authority figure is a celibate, elaborately costumed octogenarian who is the spiritual leader of one of the world’s largest religions (and smallest country). OK. Maybe it doesn’t make perfect sense. But Pope John Paul II famously blessed the Ferrari factory, and actually ditched his Popemobile for a Mondial on a tour of Fiorano. John Paul II was also the recipient of the last production Enzo–which was sold for charity–so it’s not like this is the first time His Holiness has every blessed a vehicle. And since the 110th anniversary celebrations include events all over the world, the Hog’s audience with the Pope doesn’t seem as out there as it initially might, and in heavily Catholic Italy, should generate some nice press for the MoCo. It’s not clear whether His Holiness will ditch the Popemobile for a 2013 CVO Breakout, but rumors suggest he’s considering repealing Vatican City’s helmet law. Better sound and more power are two things we hear guys asking for once they get their new bikes home. It seems that everyone out there is trying his or her hand at creating an exhaust system. Sometimes, the pipes we get our dirty little mitts on fall short on one thing or the other. Some have a great sound but have no gains or even rob the bike of power. Some may be able to add a few ponies to the bike but look like crap or sound bad. So whenever we hear “check out my pipes and get 15hp just by bolting them on,” we tend to find it hard to believe. The same thing happened when Little Mike from MGS Custom Bikes called and said that the shop spent a lot of time perfecting a true dual exhaust system for the bagger market with a top-secret muffler design that will give a 15 percent gain in power and sounds as good as it looks. I told him it was hard to believe. To prove it, he sent over a dyno sheet from the last set that the shop installed on a customer’s Road Glide. The bike picked up more than 12hp and the fuel/air ratio was right on. We told Mike anyone could show off a dyno sheet with a few good pulls. He told me to come see it for myself, and later that week he was doing the same install on a ’10 Street Glide. He said if the pipes did not do what he said they would, he would fill my gas tank up and buy me the best dinner in the Antelope Valley. I figured why not? A free dinner is a free dinner. MGS Custom Bikes is a Dyno-Tuning center, and been certified as the only Dyno-Tune center in the Antelope Valley so we knew this was going to be the real deal. Big Mike showed us the pipes and said that after installing and tuning other manufacturers’ pipes for years, he started to figure out the good and bad with exhaust systems. With all that knowledge of pipes and performance, he decided to build a set for his personal bike. After testing, the pipes made good power and sounded great. He eventually began making them to see if his customers would like them. One cool thing about the True Dual is that the head pipe comes with both sizes of 02 bung ports: a set of 10mm ports for ’10 models and 5/8-inch ports for the older bikes. 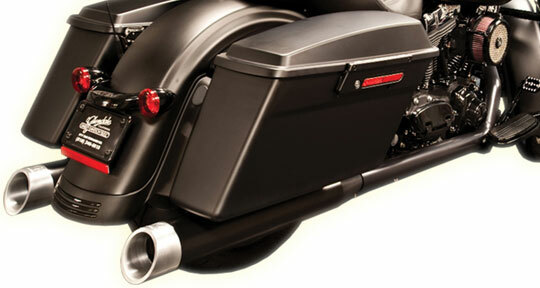 The pipes are available in show-quality chrome for $989.95 or black ceramic for $1,189.95. 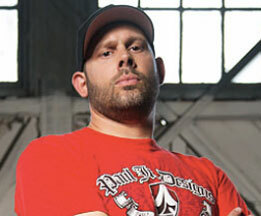 Big Mike also recommends that every bike get tuned once the pipes are installed to ensure it runs at its best. If you want longevity from your bike, it is more important to have it running with the best air-to-fuel mix than just getting big power numbers. We started with Little Mike bringing the bike up to running temp on the dyno to get a base run and see just where the ’10 Street Glide was with the numbers. After two dyno runs, the SG squeezed out 60.1hp and 74.6 lb-ft of torque. Not bad; just about what we expected. Looking for a performance package that wont bog down your wallet? Then this is the deal for you!! MGS True Duals exhaust systems come complete with head pipe, heat shield, muffler, baffles, all mounting hardware, choice of tips (chrome extra) and two threaded o2 sensor ports with plugs for complete universal fitment of ALL 1995 to 2012 Harley-Davidson FL Touring models. Made of 16-gauge steel, stepped head pipes, full-coverage heat shields and massive 4-inch mufflers with a billet tip that produces a deep, rich rumble. Dyno-developed by MGS to produce more horsepower and torque than the competition. In most cases a 15% gain at the rear wheel. The MGS True Duals are one of the easiest ways to bolt on additional horsepower and torque. OVER 12+ ft lbs of torque!